Bargain Hardware have a long list of refurbished AMD CPUs in stock, ready to ship and at some of the cheapest prices around. As the first CPU manufacturer to integrated graphics into CPUs AMD offer some fantastic products at cheap prices. 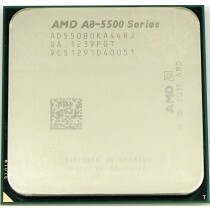 AMD Athlon and A-series processors with Radeon graphics are great all-in-one processors. Upgrading your CPU is a cost effective way to seriously prolong the lifecycle of your desktop PC and AMD systems are no different. Motherboards support a wide range of processors and often systems are shipped with low-to-mid range CPUs from new, which allows you to upgrade cheaply with a Refurbished AMD Phenom, Athlon or A-Series processor. If working with a tight budget or looking for a home theater PC (HTPC) AMD's APU (Accelerated Processing Unit) could be a solution for you. These processors come with integrated graphics which save you money on a dedicated graphics card while being powerful enough to handle all of your everyday tasks; such as streaming, or light gaming all on one chip. With a vast range of Dual-Core, Quad-Core, Hyper-threaded and integrated graphics used AMD CPUs in stock, Bargain Hardware have the right CPU upgrade for you and ready to ship worldwide.